LOS ANGELES, Calif. /California Newswire/ — Dr. Irene Bih Wakam, a family physician practicing in Ventura, Calif., has been awarded the 2015 Global Health Excellence Award from Student International Development Engagement (SIDE), a program in which students travel abroad to enrich their global experience and contribute to development issues. Dr. Wakam volunteered as a member of a team of local and international volunteers, executed and assessed the success of the second annual Baligham Village health fair, sponsored by Student International Development Engagement (SIDE) on June 13, 2015 to provide health care and disease prevention to Baligham, a remote poor village in Cameroon. On top of poverty, poor road conditions and scarce transportation options make it difficult for Baligham villagers to seek medical care and treatment. Pregnant women and lactating mothers and their babies have to travel 10 miles on very rough and bumpy roads on foot or ride motorbikes before they can take a taxi to travel another 15 miles to seek medical care. Dr. Wakam had to travel by bush four wheel drive taxi, and foot to get to Baligham. The children she treated were suffering from respiratory infections, intestinal parasites, diarrhea or malaria, all of which are preventable diseases. In addition, maternal health services and a safe place to give birth are not available to pregnant women in this remote poor village. The low percentage of pregnant women giving birth in the poorly equipped government run Baligham health post, do so under unsanitary conditions and have to pay for their own drugs and supplies. Dr. Wakam secured donations of needed medication and medical supplies from Johnson & Johnson Company for the health fair and used her own funds to help pay for more medication and travel expenses. 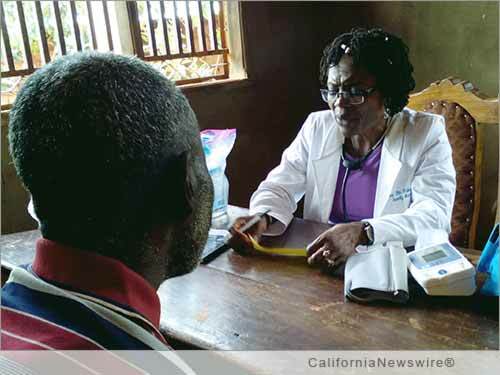 "The lives of Cameroonians living in remote poor villages like Baligham can be transformed, by providing access to basic services such as water, sanitation, electricity, medication, health care providers and road improvements," says Dr. Wakam. "We sponsored the Baligham Mobile Health Fair in an attempt to raise even more awareness for the plight many people; men, women and children are facing in underdeveloped villages in Cameroon such as Baligham," said Margaret Galabe, author, award-winning humanitarian, philanthropist, and founder of Student International Development Engagement. "Volunteers have always been and will continue to be at the very heart of these worthwhile events, and this is a call out to any that want to join us. Ten or twenty people aren't enough unfortunately. To help a village, you need a village of people who are more than willing to assist," adds Galabe. Student International Development Engagement, or SIDE for short, invites international students to attend a six week, highly intensive summer volunteering, service learning and internship, where they are culturally immersed in remote, rural villages in Cameroon, Central Africa, so as to gain a greater understanding of the issues that engulf the people of these villages. Through SIDE's mission, sustainable development initiatives and cross-cultural experiences are fostered SIDE is an agile, ambitious, collaborative and forward thinking non-profit organization that provides an unparalleled student service, ensuring it continues to foster stronger relationships with both its students and partners locally and internationally. SIDE was established in 2011 by award-winning philanthropist Margaret Galabe, who serves the organization as its executive director. SIDE is based in Palmdale, California, USA and Bamenda, Cameroon. To see how SIDE can promote success through its student summer volunteering, service learning and internship programs, visit their website: http://StudentInternationalDevelopmentEngagement.com/.